There are four basics area of concern that be considered while preparing and conducting combat operations. They are security, firepower, movement, and communications. Surprise and freedom of movement are essential to the success of SO. These vital factors are based on accurate and timely intelligence. Because of the nature of SO, all aspects of OPSEC should be rigorously observed throughout the planning cycle and during the conduct of operations. The mission is defined as those operations conducted by specially organized, trained, and equipped military and paramilitary forces to achieve military, political, economic or psychological objectives by non-conventional means in hostile, denied, or politically sensitive areas. SO missions primarily involve two types of combat patrols: Special Reconnaissance (SR) and Direct Action (DA). SR Mission SR complements national and theater intelligence collection assets and systems by obtaining specific, well defined, and time-sensitive information of strategic or operational significance. DA Mission In the conduct of DA ops, The patrol may embloy raid, ambush, or direct assault tactics. They may embplace munitions and other devices, or conduct standoff attacks by fire from air, ground, or maritime platforms. They may also provide terminal guidance for precision-guided munitions, and conduct independent sabotage. DA ops are noramlly limited in scope and duration and usually incorporate a planned withdrawl from the immediate objective area. SOF may conduct these missions unilaterally or in support of conventional operations. How valuable is the target? What is the gain-to-loss ratio between the values of destroying the target and losing the patrol in the objective area? Is the target a riverine or maritime SO target? Completely destroy the target and prevent any repair of its capabilities within a tactically significant period. Destroy sufficient parts of the target to prevent its use within a tactically significant period. Can the patrol deliver sufficient force to prevent the target from using its capabilities within a tactically significant period? Is the target vulnerable to attack by the patrol? Is the size of the installation and guard force such that the target is within a platoon’s capabilities? Given the rules of engagement (ROE) in effect, is the degree of force required consistent with respect to limiting damage to non-military targets? Does target destruction have enough of a political-military impact on the populace to alter the ability of the enemy to wage war? Are psychological warfare forces required in connection with the operation? Is the target sufficiently recognizable that it can be rapidly classified and attacked without losing an unacceptable amount of time during identification? Given the nature of the environment, is the target identifiable at sufficient range to allow a tactically advantageous attack? What effect will the operation have on the politics of the region? Will it lean the government’s politics one way or the other? If a counter-guerrilla operation, will the population favor the actions taken or will it strengthen the resolve to support the guerrillas? How will the military be affected by the mission? Will the military’s stature within the country be altered? What will be the resultant effect on the enemy’s strategic or tactical capabilities? The acronym OCOKA details the factors that should be used to analyze terrain. It is used as both a planning tool prior to the patrol as well as a working tool throughout the patrol. Observation and Fields of Fire. The effects the terrain will have on observation and fields of fire influence selection of and movement over a route. The PL must constantly consider the observation and fields of fire available to his patrol and the enemy. This affects formations, rates and time of movement, and methods of control. Cover and Concealment. For most patrols, stealth is extremely important to the success of the mission; therefore the patrol must always consider the proper use of cover and concealment in deciding the proper tactical approach or attack. Both cover and concealment are protection from enemy fire and may be either natural or artificial/manmade. The most important distinction between cover and concealment is that cover provides protection from some types of enemy fire while concealment merely hides the concealed element. Natural cover includes logs, trees, rocks, stumps, depressions, ravines, hollows, reverse concave slopes, etc. Artificial/manmade cover includes fighting positions, trenches, walls, buildings, rubble, abandoned equipment, bomb craters, etc. When moving, use a route that puts cover between your patrol and the places where the enemy is known or thought to be. Use hills and wooded areas and other natural cover to hide or conceal movements. Ravines and gullies can also be used, but caution must be exercised to avoid channeling the patrol into possible ambush sites. Avoid open fields and “sky-lining” on hills and ridges. Make a habit of looking for and taking advantage of every bit of cover the terrain offers. This habit should be combined with proper movement techniques. Avoid unnecessary movement. Remain still; movement attracts attention. You may be concealed when still, yet easily detected if you move. Movement against a stationary background causes you to stand out clearly. When you must change positions, move carefully over a concealed route to the new position. Keep quiet. Noise caused by talking, changing a magazine, or cycling a bolt can be picked up by enemy patrols or listening posts (LPs). The noise created by loose equipment, particularly metallic sounds, carries over long distances and is easily discernable. Properly secure your equipment for noise discipline. Darkness alone does not hide you from an enemy with night vision, thermal, and/or motion sensors. Stay low when observing the area. Observe from a crouch, a squat, or the prone position. In this way, you present a low silhouette, making it difficult for the enemy to see you. Background is important, blend with it to prevent enemy detecting your position. Trees, bushes, grass, earth, and manmade structures forming your background vary in color and appearances, making it possible for you to blend with them. Select trees or bushes that blend with your uniform and absorb the outline of your figure. Natural concealment is provided by your surroundings and needs no change to be used; for example, bushes, grass, and shadows. The best way to use natural concealment is not to disturb it when moving into an area. Artificial concealment is made from materials such as burlap or nets, or from natural materials such as bushes, leaves, and grass that are moved from their original location. Be sure to consider the effects of changes of season or location on the concealment provided by both natural and artificial materials. Shadows help to hide you. Shadows are found under most conditions of day and night. Expose nothing that shines. Reflection of light on a shiny surface instantly attracts attention and can be seen for great distances. Keep off the skyline. Figures on the skyline can be seen from a great distance, even at night, because a dark outline stands out against the lighter sky. The silhouette formed by your bodymakes a good target. Alter familiar outlines. Military equipment and the human body are familiar outlines to all soldiers. Alter or disguise these revealing shapes. Obstacles. Obstacles, both natural and manmade, must be considered in planning routes and throughout the patrol. They may stop, divert, or impede movement along a route or limit maneuver. Obstacles that may limit or restrict enemy action/reaction may be used to your advantage and should be exploited. Key Terrain. Key terrain features are those that have a controlling affect on the surrounding terrain. Key terrain features must be identified and actions planned to take advantage of them. Similarly, the advantages offered to the enemy by key terrain features must be countered. Avenues of Approach. The PL and team leaders must analyze the avenues of approach into patrol positions and when on the attack into the enemy’s positions. Whenever the patrol moves into a patrol base, LUP, RP, or ambush site, proper defense and security of avenues of approach is a major consideration for establishing all around security. The importance of recon cannot be overstated; it is essential in both the planning and conduct of patrols. It can be accomplished in several ways. Consideration of the terrain in relation to all available information of known and/or suspected enemy positions, patrols, and previous ambush sites. Evaluation of the terrain from the enemy’s perspective: where he could establish installations, patrols, ambushes, etc. Whenever possible, the PL should make an aerial recon. The purpose of the recon is to obtain current and more complete information on the enemy situation, roads, trails, manmade objects, type and density of vegetation, and seasonal condition of rivers and streams than is available from a map recon. It may warn the enemy. Structural strengths of roads, bridges, rail systems, and buildings or structures, cannot be determined. Terrain surfaces may be misinterpreted. Mines, booby traps, and well-prepared ambush sites may not be detected. Any additional OCOKA considerations applicable. The patrol may be ordered to follow a specific route due to situation and mission requirements or it may be able to select its own route. OCOKA criteria, as discussed above, should be applied directly to assess patrol routes. Minimize chance of contact with local populace by avoiding manmade features and structures such as trails, buildings, wells, farms, campgrounds, etc. In threat areas, take advantage of more difficult terrain such as swamps and dense woods. Maximize use of identifiable re-set points to assist with navigation. Avoid moving along exposed ridges. Move along the slope below the ridge to prevent silhouetting. Avoid areas that may be mined, booby-trapped, or covered by fire. For daylight movement, seek terrain that offers the most cover and concealment; avoid open areas. Seek terrain that permits quiet movement at night. Study the Route. Study maps, aerial photos, or sketches and memorize the route before starting.Note distinctive features (hills, streams, and swamps) and their locations in relation to the route. If possible, “box” the route in with terrain features to aid in navigation. Alternate Routes. Plan an alternate route in case the primary cannot be used. Route Offsets. In difficult terrain such as jungle or swamps, plan an offset to a known terrain feature. Checkpoints. Establish checkpoints for the patrol routes. They are a means of control between the parent unit and patrol. These locations are decided upon and coordinated before the patrol leaves, so that both the patrol members and parent unit will know where the patrol is when the patrol reports its execution checklist items. The parent unit can follow the progress of the patrol without transmitting coordinates in the open. It is also an excellent means of coordinating the patrol route with a fire support plan. Target Reference Point. A target reference point is an easily recognizable point on the ground, either natural or manmade, used for identifying enemy targets or controlling fires. These are used with the route plan and checkpoints in planning and controlling fire support. The patrol spends more timemoving than fighting. Moving carelessly may cause a patrol to make contact with the enemy unintentionally or when the patrol is unprepared. The goal of effective movement is to make contact with the enemy on your terms, rather than his. The fundamentals of movement include: 1. Using covered and concealed routes 2. Avoiding routes or actions expected by the enemy 3. Conducting observation and reconnaissance prior to movement 4. Accurately navigating 5. Maintaining all-around security (including air guard). Consider all movements to be tactical movements. Take maximum advantage of weather conditions and ambient noises that can mask patrol noise and cover tracks. Without a guide or unless familiar with the area, night movement may be difficult, but necessary to avoid detection. Maintain visual contact between patrol members; hands-on contact may be required if visual contact is not possible. "Ranger tabs", IR strobes, or reflective glint tape attached to the inside fold of the collar or back of headgear can be effective for maintaining control. The rear part of the patrol remains in place. The leading part retraces his steps to make up the separation, moving back on the route just patrolled. Patrol will rendezvous using a challenge and reply. If all else fails, proceed to the last enroute rally point. Exercise firm noise and light discipline. The glow of a red lens flashlight may give away a position. A shield my be used when conducting a map study with a flashlight. Avoid movements on trails, except when speed is essential and the expected threat is very low. 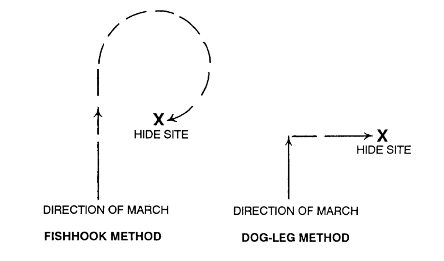 Use operational deception (OPDEC) by never using the same trails or routes. This is especially true when entering or leaving a FOB or forward operating location. An essential tenet of successful small unit tactics is the ability of the PL to organize the unit to maximize its maneuverability. Tactical maneuverability is the ability of the patrol to flexibly organize and reorganize to meet the current threat and conditions with minimum communication, while maintaining unit integrity and control. Use of Maneuver Maneuver is used to describe the actions of a unit when one element is moving to a position to fight the enemy and another element is supporting that movement by fire. Maneuver is used ONLY to describe actions in contact with the enemy. Weapons fire control is required by all when a patrol or element is fighting the enemy. Trajectory. Trajectory is the path of the projectile in its flight from the muzzle of the weapon to the point of impact. At greater ranges the shooter must elevate his weapon. This raises the height of the trajectory. Danger Space. The danger space is the space between the weapon and the target where the trajectory does not rise above 1.8 meters (the height of an average man). Cone of Fire. Each successive round fired from the same weapon at a target assumes a slightly different trajectory through the air. Taken together, these different trajectories form an elliptical impact pattern on the target that is called a cone of fire. The cone of fire is caused by variations in aiming and holding the weapon, vibrations, ammunition, wind and atmospheric conditions. Over uniformly sloping or level ground the beaten zone will be elliptical. If the ground slopes downward, the beaten zone will be longer. If the ground slopes upward, the beaten zone will be shorter. Casualty Radius. When high explosive projectiles are fired, they produce casualties by fragmentation and concussion. Casualty radius or fragmentation range is the area around the point of impact where personnel can be expected to be injured or incapacitated. Riflemen will shoot point targets with effective fire. The PL/APLs primary responsibility is to direct the actions of the elements, his secondary responsibilities are to engage the enemy. AW men will shoot with controlled rates of fire. Ensure illumination is kept constant, if used. Taking corrective action when unsure of position (e.g., stop and take resections, or patrol to an obvious reset point). Keep yourself oriented at all times. As you move along, observe the terrain carefully and mentally check off the distinctive features you noted in studying and planning the route. Many aids are available to help you check and double check where you are and where you are going. The location and direction of flow of principal streams. Hills, valleys, and peculiar terrain features such as swamps and barren areas. Railroad tracks, power lines, roads, towns, and other man-made objects. What to do if lost. This should never occur; especially with the use of handheld GPS. However, should you lose your way, do not continue until you have reoriented yourself with respect to the immediate terrain and position of the enemy and friendly forces. Keep calm and think the situation over. Use of a map and compass in correlation with the terrain is the best way to determine your location. If you do not have a map, establish the direction in which youwere traveling (with a compass, or in relation to the sun, moon, or identifiable terrain features). Mentally retrace your route, recalling hills, trails, streams, and other terrain features you passed. If necessary, go back in the direction from which you came until you find features from which to orient yourself. Northeast (45 degrees) is to your right front. East (90 degrees) is to your right. Southeast (135 degrees) is to your right rear. South (180 degrees) is to your rear. Southwest (225 degrees) is to your left rear. West (270 degrees) is to your left. Northwest (315 degrees) is to your left front. Prior to moving from the RP to the objective. When stopping to rest or discuss plans. When listening/watching for the enemy. During any prolonged stop (for rest, eating, or sleeping). Set perimeters with a minimum number of alterations in the patrol formation. Use camouflage techniques and take maximum advantage of the existing cover and concealment. Position heaviest weapons (AWs and GNs) to cover most likely avenues of enemy approach. The PL may position each person as he moves into the perimeter. Whenever possible, fishhook into perimeters in order to watch for enemy trackers. Baseline perimeter radius should allow each man to see the men on either side of him. Size depends on illumination, cover, terrain, and situation. Perimeters can be set in various formations to take advantage of patrol composition and the terrain. Rest is a weapon; use it to your advantage. Breaks must be called frequently to give opportunities for rest, observation, and listening. Terrain difficulties will usually dictate when to take breaks. “Halt”, “rest” and “break.” means the same thing. The patrol can go only as fast as the slowest man. Remember the RTO and AW men are carrying the greatest weight. It is better to take breaks early to maintain stamina rather than push men to fatigue. Each man face in his direction of responsibility.